I’m blaming Snoopy. Yes, Snoopy, the beloved dog from the “Peanuts” comic strip. Curse him! If I hadn’t grown up watching Snoopy interact with Charlie Brown and his friends, I wouldn’t be the softy (read: sucker) for animals that I am now. I’m not sure if it’s me or my van, but one of us is a magnet for mutts. Lost mutts, to be exact. I/We have found more than four wandering animals in as many years. We don’t need another cat or dog, but they somehow find us. Our most recent discovery is Happy. My teenager called me last Friday at eight o’clock in the morning. This surprised me, because I thought said child was in bed asleep in the next room. “Where are you?” were my first words. After learning my teenager actually decided to wake up early and go for a run, which was shocking enough, I learned there was a scared “puppy” under a truck who needed help. The next thing I know this so-called puppy, who actually is a 1-2-year-old, 55 lb. dog, arrives through our backyard gate. My child had already named her Happy. Happy, indeed. 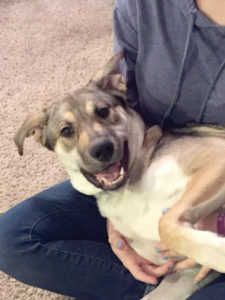 This dog is so happy to be inside and fed and loved that all she does is wiggle with excitement. Nonstop. Our other dog was also happy to have a playmate — for about the first 10 minutes. She soon grew tired of the constant activity. Our older cat absolutely stood his ground and quickly showed Happy who is the alpha animal of the house. And our younger feline, also a homeless animal found as a kitten one year ago, has yet to truly warm up to our extremely exuberant guest. We took Happy to the vet to check for a microchip. My best Columbo detective work discovered: Happy does not like getting into or out of cars, going to the vet (we had to carry her inside) or being weighed. She also did not have a microchip or a collar. I contacted Dallas Animal Services to report the found dog. While finding the proper contact numbers on their website, I noticed they had 363 dogs available for adoption! I moaned out loud, knowing we were going to be stuck with this dog. Don’t get me wrong. If you can’t already tell, my family and I love animals. But we do not have room for another dog, happy or not, in our lives or our home. Please, animal owners, MICROCHIP your pets! Someone out there is really sad right now because their beloved happy dog is missing. She’s found! We have her! Come get her! If you had been a responsible pet owner, she’d be home by now! It is now the law in Dallas County that all pets MUST be microchipped. Many vets, and the SPCA of Texas, offer low or no-cost microchipping and vaccinations. Veterinarians will also check lost dogs or cats for microchips for free when an animal is found. Please protect your animals today so, if they get lost tomorrow, you can be reunited with them in no time. You and your pets will be happy you did!